Hey Ladies !! Well I just wanted to write a very short and sweet blog to update you ! well get this... She says to me, "I like your hair today. It looks nice." :-O *jaw drop* Did I hear her correctly??? Wow !!! lol... My sister always asks me if I'm going to straighten my hair, or get it blown out and I constantly tell her no, I don't like it straightened. This is the first time she's told me that my natural hair looks nice, as is. I was shocked, like Fred Sanford, hand over heart, "Elisabeth, I'm coming to joing you !" shocked. Don't get me wrong, she doesn't call my hair ugly, but whenever I ask her if she likes it, she says how it will look cuter once it gets longer. Can't say I disagree with that, because I honestly have always felt that way. Here is a pic of my puff today. My hair almost completely covers the back of my hairline!! I can't wait to see my ponytail in another 8 months ! ... and to the transitioners, hang in there!!! 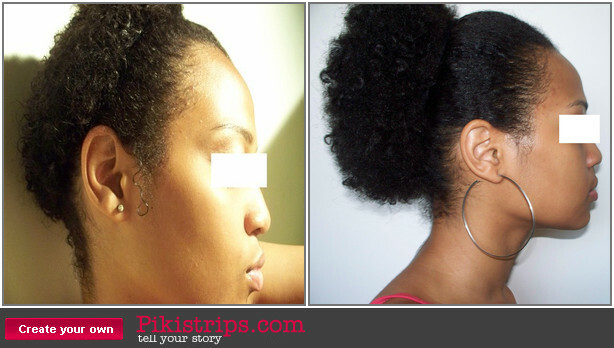 Here is an 8 month comparison of my afro puff. The pic on the left is from August 2, 2009 (4 days after the BC). The pic on the right is today, April 1,2010 ( almost 8 months later)!! My hair has been growing the average 1/2 inch a month, nothing miraculous. I'm just glad to be retaining the length. congrats!! 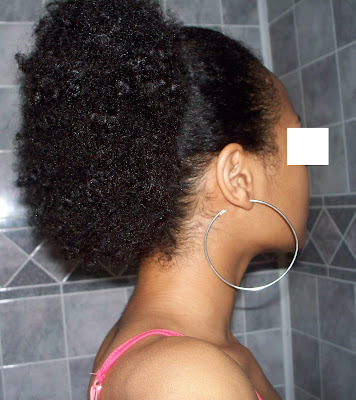 Your puff is so full and big that if it were mine I'd have a hard time stopping myself from playing with it. Love it! Thank you Big Sis !!! ITA, I'm so glad I did the BC and to have healthier hair!! I just love looking at other's progress pics too ! I have you to thank for this puff because I used the Moisture Booster combo here to acheieve it !! Omg your puff is getting huge Shelley! @ Mrs- Thank you SO MUCH !!!! That puff is beautiful, keep up the good work. I miss seeing you on youtube but I guess you have to do what you have to do.